James Harry McLain, age 65, of Davison, formerly of Lapeer, died Tuesday, November 13, 2018. He was born April 23, 1953 in Hillsdale, Michigan, to Eldren “Red” and Donna (Clower) McLain. Jim graduated in 1971 from Lapeer High School and married Deborah Kohler on August 22, 1981 at St. Mary’s Catholic Church – Burnside. 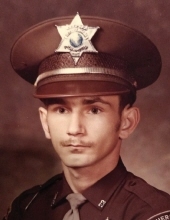 Jimmy started working for Lapeer County Sheriff’s Department in 1975 and retired in 2015, after 40 years with the Department. He held many positions with the Sheriff’s Department and made many dear friends. At the time of his retirement, Mr. McLain was a Lieutenant, in charge of the Road Patrol. He was member of the Davison Fraternal Order of Eagles #3589. Mr. and Mrs. McLain have been members of Immaculate Conception Church in Lapeer for over 37 years. James is survived by his wife: Deborah McLain of Davison; children: Jeremy McLain of Imlay City, Donna (Eddie) Tookes of Davison, Michael (Daphne) McLain of Saginaw and Richard (Samantha) McLain of Davison; grandchildren: Molly, Riley, Casey, Carly, John, Richard, Roger and Edison; siblings: Dan (Linda) McLain of Birch Run and Charlotte (Bob) Donnel of Ann Arbor; sister-in-law: Sue McLain of Indiana; and many nieces and nephews. He was preceded in death by his mother: Donna McLain; father: Eldren “Red” McLain; step-mother: Margaret McLain; and brother: Chuck McLain. "Email Address" would like to share the life celebration of James Harry McLain. Click on the "link" to go to share a favorite memory or leave a condolence message for the family.